This authentic Filipino kinilaw recipe is easy to make and is so much better than ceviche or poke. I hate to frown upon the poke craze, I loved eating it in Maui and shared a recipe to make poke in five minutes. But the poke craze went hog wild and now poke refers to anything and everything raw. I went to a poke restaurant in Toronto and it was such a crummy version that it was time to leave poke alone. But I love raw fish and so when Chef Crush Sheldon Simeon explained Filipino kinilaw on Top Chef I knew I had to make it. Filipino food has a special place in my heart. 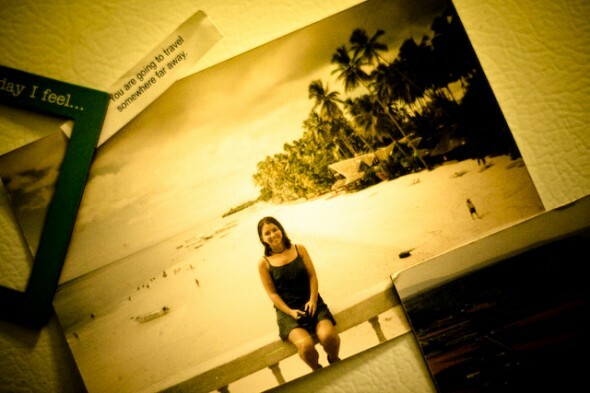 I lived in the Philippines in 1999 in Cebu for a program that helped recent graduates get international business experience overseas. Remember that big Y2K scare? I fled for a beach because I thought if the world was going to crumble I wanted to be somewhere beautiful. As you can see there was nothing to worry about. In English, Kinilaw literally means “Eaten raw” and while it’s often called Filipino ceviche I think it’s simplifying it a bit. I have the same issue calling poke Hawaiian ceviche. 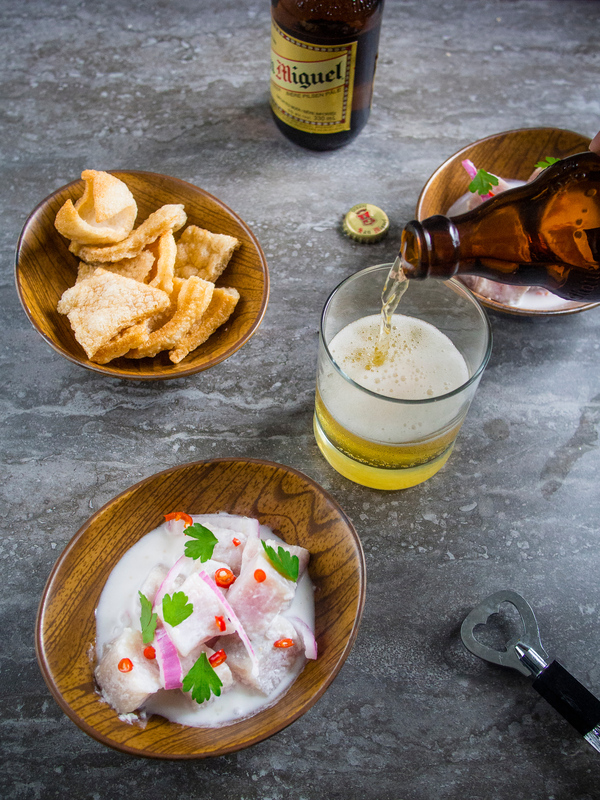 But like poke and ceviche it’s usually eaten before a meal as a snack or with beer – known as pulutan. 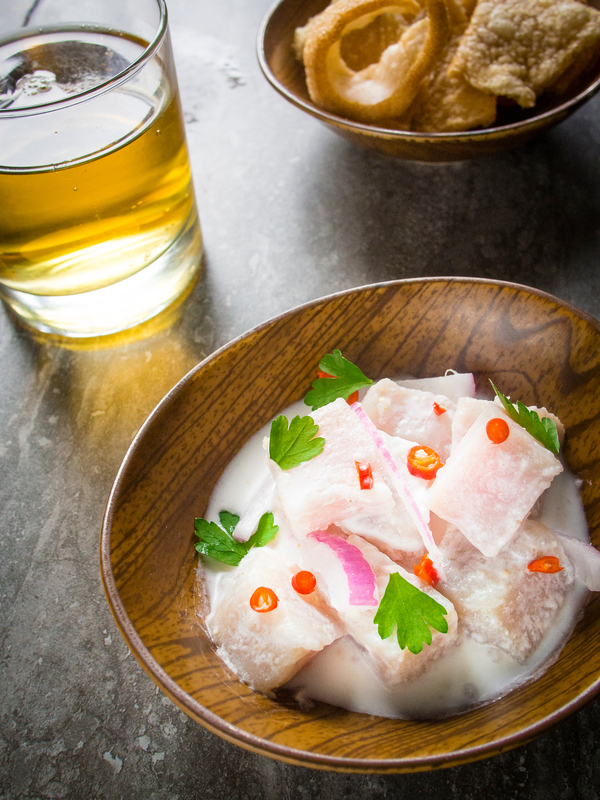 Kinilaw also has a lot of the same properties you love about ceviche. 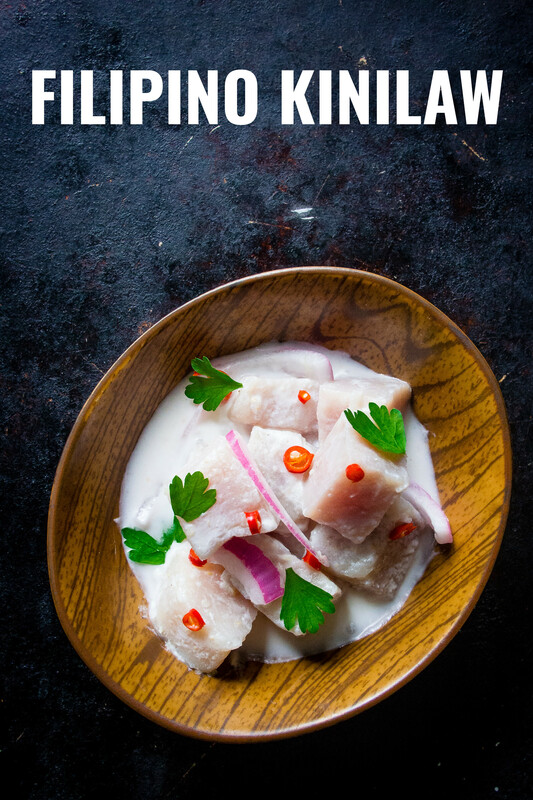 If you look at this recipe for Mexican ceviche, Ecuadorian ceviche, Peruvian ceviche you’ll see one common thread – lime juice. The acid in citrus “cooks” the seafood. Except with Ecuadorian ceviche where you cook the seafood first and then in acid. However, the key difference in Filipino kinilaw use a different acid – vinegar. Both salt and vinegar are in many traditional dishes as it was a way to preserve food before refrigeration. Tamarind and green mangos in a recipe create a sour flavour. Fresh ginger and chili peppers provide a bit of spiciness. You can make Filipino kinilaw with any fish but it’s often made with what is available locally so it’s common to have Spanish mackerel, swordfish (warning: not always sustainable), yellowfin tuna, wahoo or anchovies. 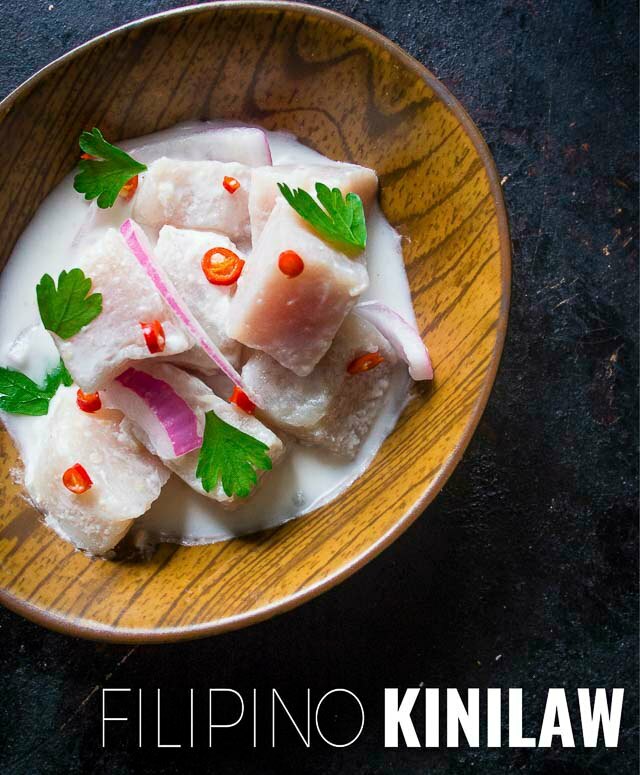 Generally kilawin is meat and cooked, whereas kinilaw is raw seafood. But the terms can be interchangeable depending on where you are eating it. Kilawin exists in the northern Philippines and prepared with meat. 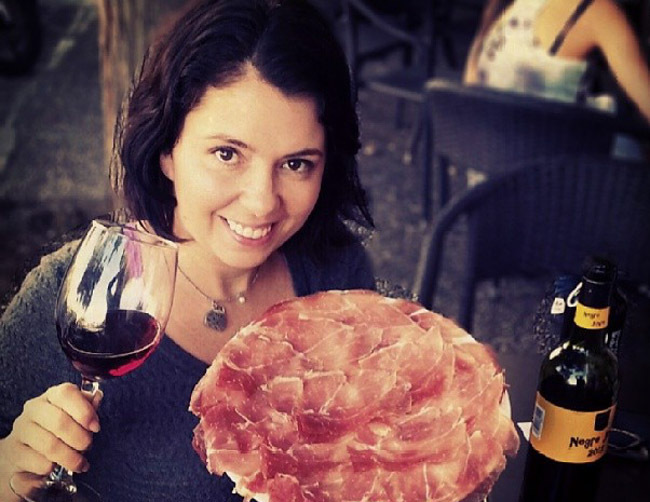 Unlike tartare or carpaccio, which are completely raw meat dishes it’s often quickly blanched or grilled first and served medium rare. It’s common to have kilawin with goat, pork, beef or chicken. But Vegetarians Can Eat Kinilaw Too! Just like vegetarian ceviche there are also versions of kinilaw with fruits and vegetables. Kinilaw is derived from the bisaya word kilaw which means eaten fresh, kilaw is uncooked or unripe like green mango. Vegetarian kinilaw often has cucumber, sweet potato, banana flowers or bitter melon. The Philippines includes over 7000 islands with more than 170 languages. This means kinilaw is also known under many names including lataven and lawal. It includes so many regional recipes from using shrimp that are still alive to raw pig heart. Calamansi or calamondin juice which is a citrus native to the Philippines. Calamansi looks like a key lime with a sour almost bitter flavour. If you would like to make the traditional recipe you can buy calamansi juice online. However, lemon and lime juice are good substitutes. Suka, aka vinegar in the Philippines. It’s most often coconut vinegar or cane vinegar, which is plentiful across the islands. It gives kinilaw a sweet sour flavour. If you don’t live somewhere with coconut vinegar you can mimic the flavour with white vinegar and coconut milk. For this reason we have two options for the recipe: a traditional Filipino kinilaw recipe, and one that uses substitutions if you don’t have access to Filipino ingredients. Cut the fillets into 1 inch cubes. Place in a bowl and season with salt and pepper. Add 3/4 cup vinegar and refrigerate for 10 minutes. Drain the vinegar gently. Return fish to the bowl. Add red onion, ginger, lime juice and coconut cream. Refrigerate for 30-60 minutes. The longer you marinate it the more firm the flesh will be. Garnish with cilantro and chili pepper. Serve with chicharron. I will try this recipe in my next party . it look like so tasty…..
I’ve never come across this before but really enjoyed learning about it. I agree that the poke craze seems to be a bit OTT, especially when I’d just as happily have a Japanese chirashi don! But I also enjoy ceviche and love seeing how different cultures have arrived at not entirely disimilar dishes. I have only had limited exposure to Filipino food, attending some pop up events here in London, and am keen to try more! Not only is the intro to Kinilaw, unknow before I read this, sound awesome, I have a bunch of new ingredients I havenever heard of either to hopefull source…but thakns for the alternatives. Only had poke once but it was Meh so have not hopped on the big craze. I remember eating poke in Las Vegas before poke became a “thing” and jumped the shark. Now I want to try kinilaw. Looks like mouthwatering , Filipino Kinilaw will be my next recipe…. I’ve never heard of this dish or coconut vinegar before but it looks and sound amazing. Will bookmark this to make when I get all the ingredients. I will have to search for coconut vinegar because that sounds awesome. I’m not sure if they have that here in Ontario though. This is my personal favorite and I would like to share that you can do a lot of variations to it. You can try it with peanut, salted egg and/or mayonnaise. This is best served with grilled pork seasoned with salt and pepper only. I can imagine the beach while enjoying this. A must-try for everyone. I love kinilaw! I make it but without the coconut cream. What brand of coconut cream you use? I use Grace Foods but I think you could use any reputable brand.